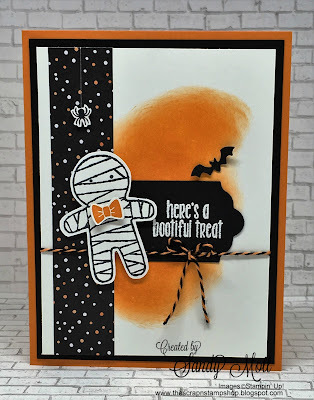 The Scrap n' Stamp Shop: CREATIVE INKING BLOG HOP - SPOOKY FUN! CREATIVE INKING BLOG HOP - SPOOKY FUN! 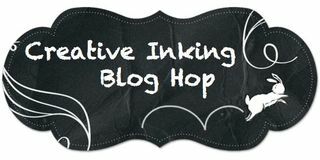 Welcome to the September Creative Inking Blog Hop! This month we are having some spooky fun. 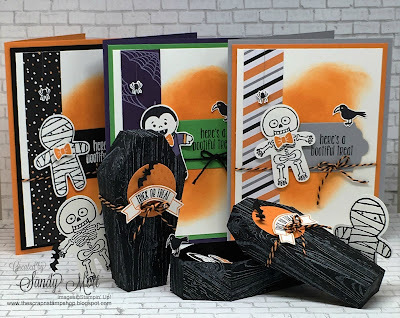 I love the "Cookie Cutter Halloween" stamp set and decided to showcase each of these spooky little friends. 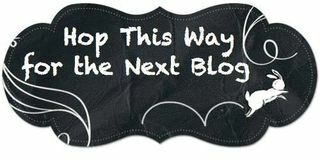 There's a lot of pictures in this post, so keep scrolling (and reading)! 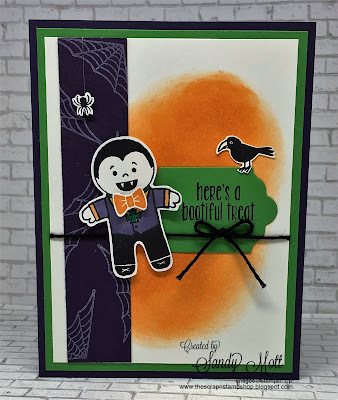 I started out with a simple card (great for a stamp-a-stack) and then I had to go and fussy-cut the spider and crow. But they're so cute! The strip of Elegant Eggplant cardstock is stamped with the spider web from "Sweet Home". 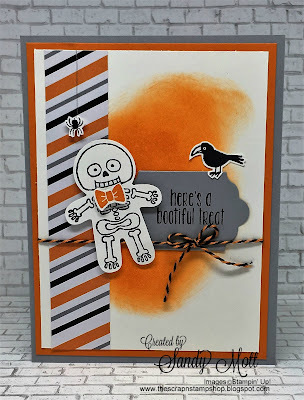 I used the Craft Whisper White ink. The spider is from the "Halloween Treat" stamp. 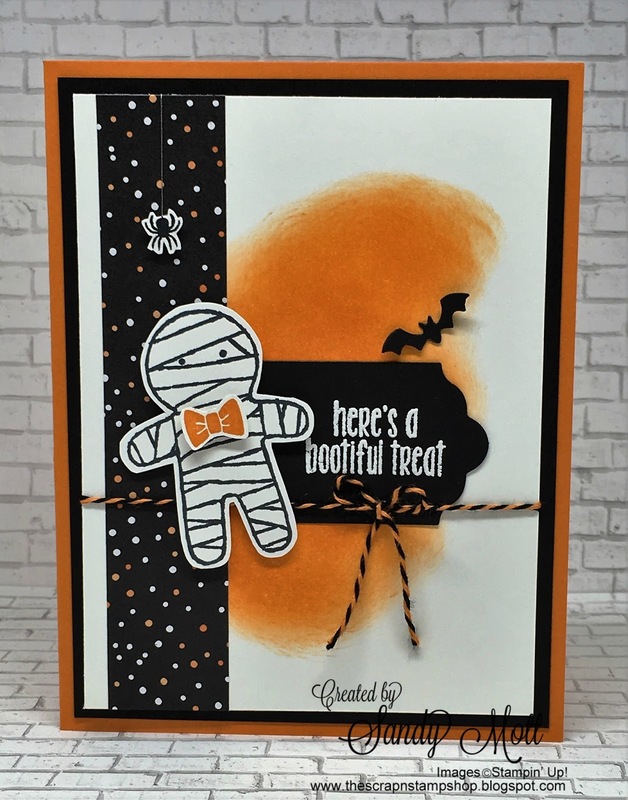 The Pumpkin Pie blob behind the sentiment is simply ink blended with a dauber. The other two cards with the Skeleton and Mummy follow suit. Then I added the mini-coffins. Aren't they adorable? Dracula is where he belongs in the coffin, and that culprit Mummy is the one who let him out. And there's no sense making a coffin without the Skeleton having something to do with it. Here's a close-up of the coffin. You can get this pattern for FREE (click HERE). It's Liz Holloway's pattern and she is giving it free for the asking. 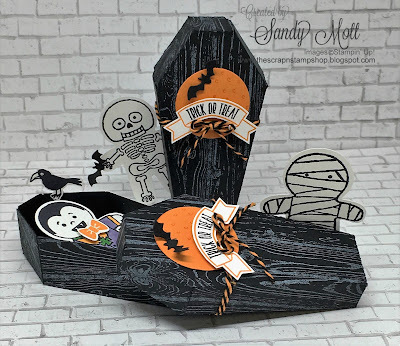 Her coffin is about 6 1/2" long, so I reduced it to about 4" to better accommodate these spooky characters. It is available as a cut pattern, or you can print and trace. 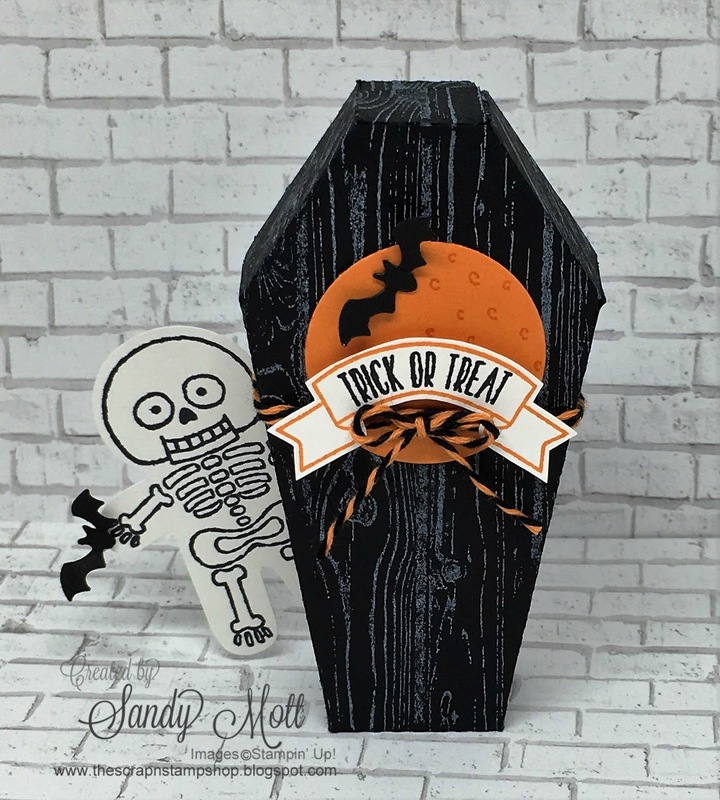 The coffin not only fits Dracula, but will fit the miniature chocolate bars or individual candies. 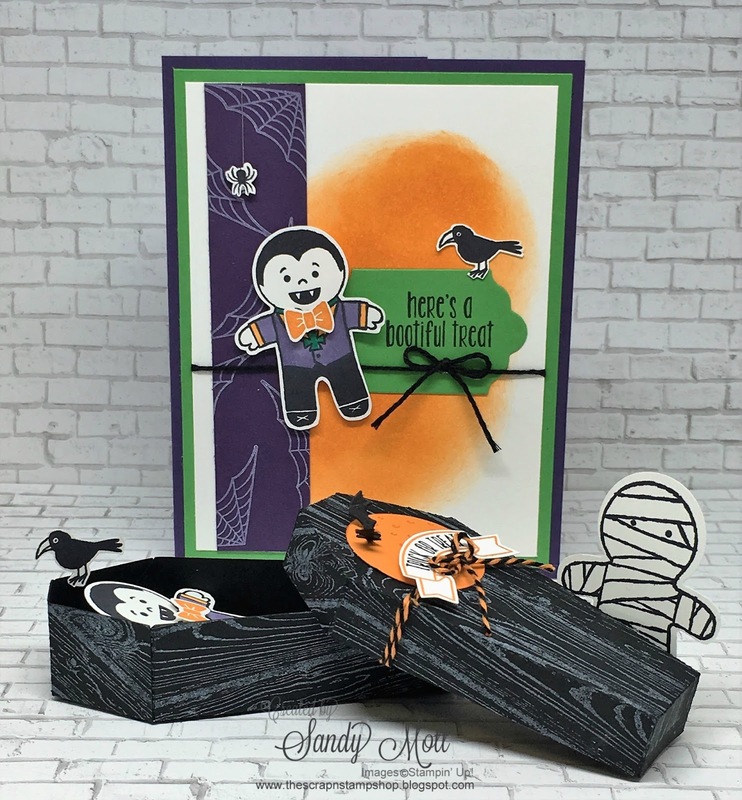 I stamped the coffins with the "Hardwood" stamp and Craft Whisper White ink. The bat and sentiment are from the "Sweet Home" stamp set. 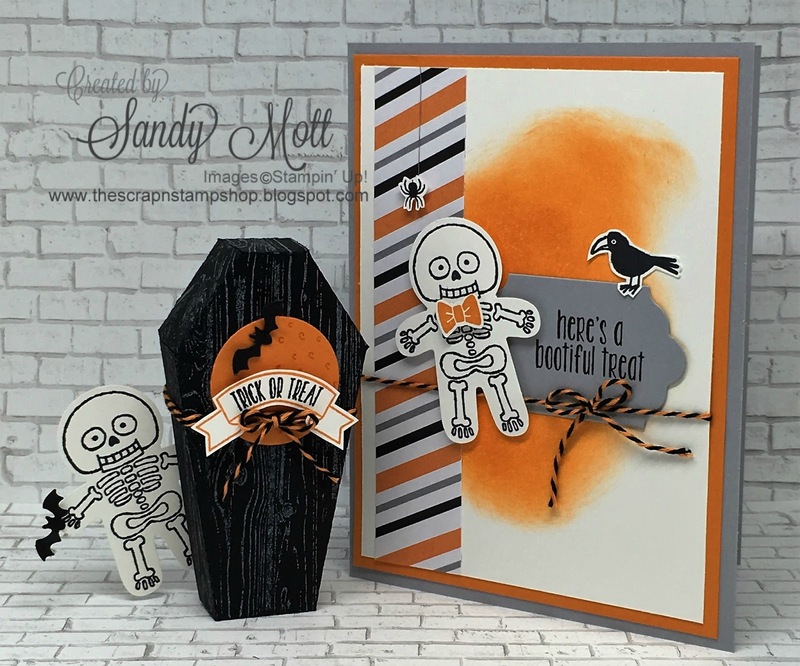 The moon is from the "Spooky Fun" stamp set. The twine is the "Halloween Night Baker's Twine". A list of all the supplies I used (less the coffin pattern) is listed below. All the items are available 24/7 from my online store. And one last thing before I go...Happy Birthday to my beautiful sister! Love you and miss you so much! I hope you enjoyed this post. Now let's go see what the talented Lori Mueller has for us! 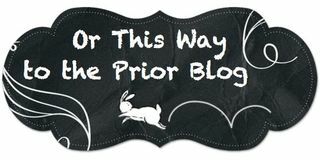 Just click on the link below to get to her blog or click on the Prior Blog to get back to Lynn Striefert's blog. Oh My Goodness! Those coffins are so adorbs! How cute! I love your cards and the coffins! They make me smile! Thanks for sharing! Thank you Kristine! So fun to make! Wow! 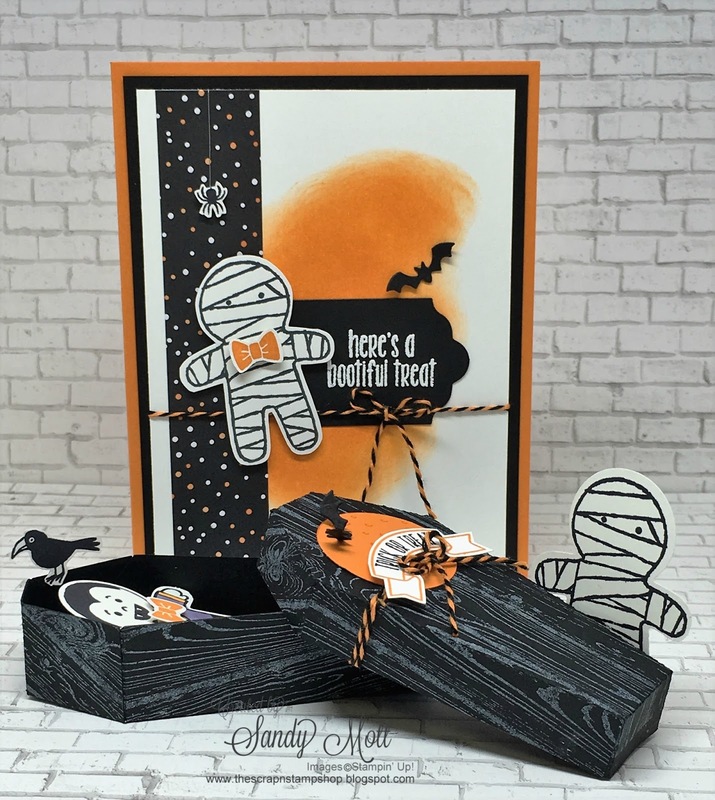 What a fantastic vignette of cards and coffins! Love them all! Thanks Lynn! I had a blast making them! Love the layout of your three cards. 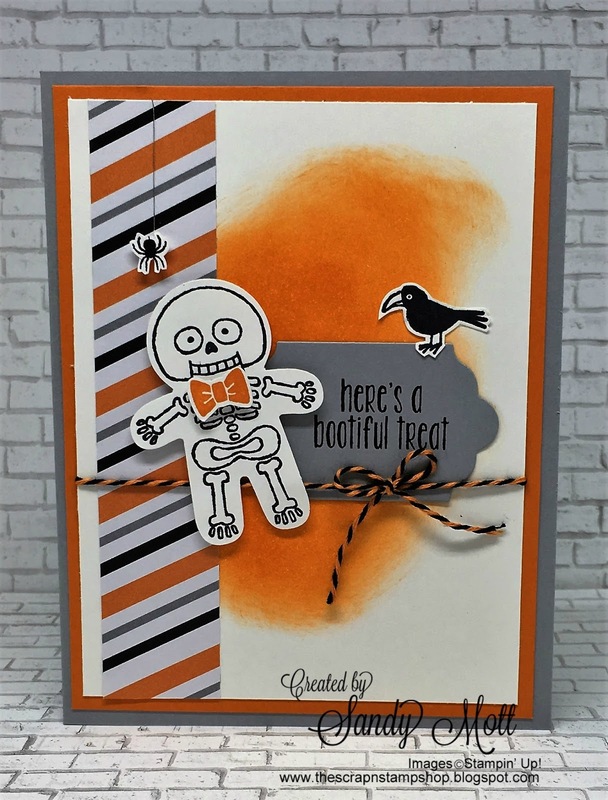 Your signature fussy cutting is amazing! And, then you added the coffins. Over the top clever and cute!!! Thanks for sharing, Sandy. Thank you Sue! They are so fun to work on! So cute!! Now I want to make one! Thanks for the link to the pattern! Thanks Susan - and you're welcome! They are easy to put together and make adorable Halloween treats. OH. EM. GEEEE! It's all adorable, but I'm not going to lie...the coffin is my FAV! Love it! Thank you Lori! The coffins were the most fun and definitely my favorite as well! Thanks Linea! And so happy you made the sampler! It's such fun and makes a great gift (or a keeper)! WOW! Great ideas & such a wonderful job!